We all do stupid things when we’re young and aimless – but robbing a university of millions of dollars worth in books?! 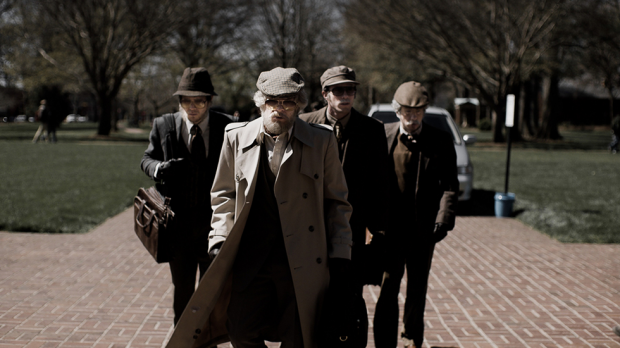 American Animals captures the true story of a group of Transylvania University students who decide to rob its library of very rare and expensive books. American Animals isn’t like any other dramatisation of a real-life heist, it includes interviews with the actual criminals and their families, which are seamlessly interwoven through the film’s story at all the right moments – never detracting from the momentum, but adding clever moments of meta punctuation. Aspiring artist Spencer (Barry Keoghan) is the one who hatches the plan, simply out of a desire for both money and excitement. His more out-going and badly influential friend Warren (Evan Peters) seems even keener for the heist, and they begin a plan without any idea how far they are going to go through with it. As their heist scheme develops, they introduce even more budding college criminals into their gang: the dark loner Erik Borsuk (Jared Abrahamson) becomes the logistics brains of the operation, and the wealthy and athletic Chas Allen (Blake Jenner) is to provide the van and be the getaway driver. As they say in Magnolia, “Well, if that was in a movie, I wouldn’t believe it.” But this ridiculous true-crime story from 2003 can’t help but reveal the stupidity and shortsightedness of their plan, yet the film seems even more keen on highlighting the eagerness and youthfulness of these four naive, yet ambitious young men. Unlike a number of the other youths-committing-crimes films, there’s a sense of morality to the characters and how they try to uphold it as they commit such a crime, which centres around the librarian of the books, Betty Jean (Ann Dowd). This differentiates American Animals from some of its similar contemporaries, as these characters aren’t entirely detached from empathy — they try to do the right thing (within their limitations), but are never portrayed as criminals who are entirely devoid of a soul. The film increases in confidence and tautness, going from fairly good at the beginning to downright excellent towards the end. There’s one too many on-the-nose mini-speeches from the characters about breaking out of their mundane boredom, which seems to grind the film to a halt while it spells out its thematic centre. But as it focuses more on the heist planning and its execution, the feelings of these isolated characters and their grandiose dreams become more illuminated in the lines between. This is a riveting and wholly engaging yarn, at times told by the culprits themselves, and is a special new high-point for the heist genre.